YARABAIKASY, Chuvashia — When Eduard Mochalov tried to have the people who stole his cattle and pig farm brought to justice, he spent eight months in jail on charges he says were cooked up. He appealed to Vladimir Putin and even set himself on fire outside the Kremlin in protest, but still couldn't draw attention to his cause as his farm slowly fell into disrepair. Now, Mochalov has found a new life as a crusading journalist investigating corruption in his native region, fueled by tips from disgruntled businessmen and government workers. Undeterred by a system where the law is selectively used to protect the powerful and crack down on critics, Mochalov has quickly earned cult status — not to mention the ire of countless local officials — throughout the small province of Chuvashia. Roughly once a month, he publishes a free newspaper called Vzyatka, or The Bribe, which rails against what it calls "Chuvash kingpins" who steal from the province's budget. Headlines include "The Governor of Chuvashia's Family Business" and "If Nobody's Been Found Guilty, That Means They're Already In Power." The paper has proved so popular that with a print run of 20,000 he has trouble meeting demand. Frustration with corrupt officials has skyrocketed under President Putin's rule. Twenty-nine percent of Russians believe that civil servants only care about using public funds to enrich themselves, a more than nine-fold increase since Putin took power in 2000, according to the Levada Center, an independent polling agency. Corruption was a key motivation behind the unprecedented series of mass protests against Putin in Moscow last winter and spring, and remains a key rallying point for the opposition. Recently, the Kremlin has attempted to siphon off popular anger by launching a major crackdown on corruption, which has cost several high-level officials their jobs. In Chuvashia, a sleepy rural region about 650 kilometers east of Moscow best known for its felt boots, Mochalov devotes all his energy to campaigning against local corruption. That makes him unusual in Russia, especially in the provinces, where few journalists seriously investigate officials and those who do frequently face violent reprisal. Chuvashia is one of the three most corrupt regions in Russia, according to the country's top investigative agency, but few cases make it to court. Officials in Chuvashia did not immediately respond to requests for comment on this story. 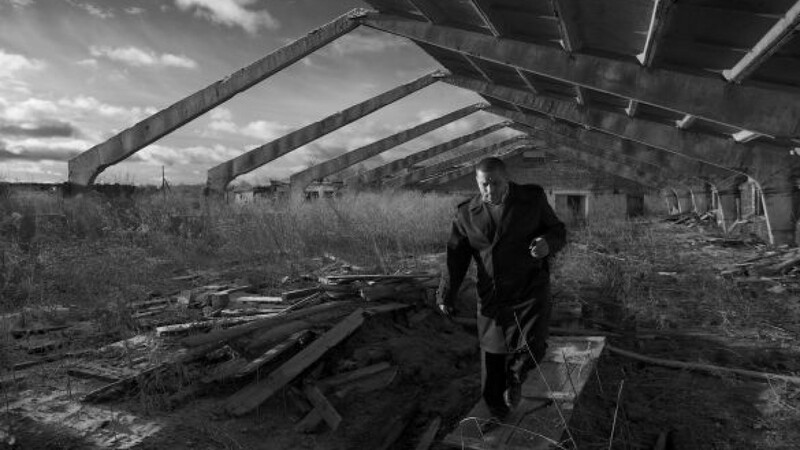 "If they brought charges based on my investigations, they'd have to arrest the entire provincial government," said Mochalov, as what remained of his abandoned hog barn's roof crumbled around him. What started as an attempt to end the legal struggles over his farm has become an all-consuming mission. The newspaper's high costs — each print run costs 100,000 rubles ($3,150) — have essentially forced Mochalov to give up his farm: He sold all his livestock and equipment years ago, and rents out some of the buildings to local services like banks and post offices. The rest lack heat and electricity, if they are still standing at all. One barn is filled with rotting bales of hay; a corrugated iron shed next to it has nearly collapsed. The change was a dramatic one for Mochalov, who left school at 16 and now at age 38 sports the thickly callused hands and yellow gap-toothed grin of the provincial farmer. He once employed 150 workers from 11 surrounding villages and ran a thriving concern trading in pigs, cows, sheep and horses. But seven years ago, Mochalov says, he failed to pay a policeman a bribe in full. Shortly afterward, men burst into his office with armed guards and presented tax papers supposedly showing that Mochalov had sold them the farm. When he filed a legal appeal, prosecutors filed charges against him instead, accusing him of having obtained credit illegally to buy the farm. After spending eight months in jail awaiting trial, Mochalov was released on time served and later succeeded in restoring his legal ownership. By then, however, the farm had already fallen into disrepair. Mochalov set about trying to bring the raiders to justice. First he tried the legal route, but to no avail. Appeals to Putin and the government also produced nothing. Then he staged protests, including the 2007 Kremlin fire stunt, which caused little physical harm aside from a few scars on his hands. The disused barn where he stores newspapers is full of banners left over from demonstrations imploring pro-Kremlin political parties to "help us fight corruption." He put his faith in Dmitry Medvedev, who served as president from 2004 to 2008 when Putin had to step aside because of term limits — but was soon disappointed. "He promised to crack down on corruption when he was elected, and I believed him!" laughs Mochalov. "I've never considered myself a member of the opposition. It's about sorting out what's wrong with our country — it's plagued by corruption." Russia is considered one of the most corrupt countries in the world. Transparency International's Corruption Perceptions Index ranks Russia 143rd out of 183 countries, level with Nigeria and below Pakistan. Mochalov puts the newspaper together in a pokey office smelling of stale varnish at the back of a truck repair shop. He prints it in a neighboring province, since no printer in Chuvashia will go near it. He only has two colleagues, a journalist and a village woman who helps hand the paper out at factories, and he writes many of the articles himself under pseudonyms. To his frustration, however, no charges have been filed against the officials exposed in The Bribe. Russian officials frequently turn a blind eye to corruption stories in the press. The Bribe has nonetheless struck a chord in Chuvashia, whose president earlier this year proposed creating a blacklist of print media "that write untruths." Several officials mentioned in the newspaper have sued him for damaging their reputation. In court, Mochalov, who says he cannot afford a lawyer, defends himself by insisting proceedings be carried out in his native Chuvash language and storming out. "All of the government knows about what he's writing," Alexei Glukhov, a local human rights activist, said. "So they try to make him look like a crazy village person who sets himself on fire, and Eduard favors the poetic aspect over the legal side. He has his own, idiosyncratic way of doing things." In a sense, Mochalov has always been something of a performer. He began his campaign to get his farm back by blocking off a highway with tractors. Earlier this year he spent 15 days in jail for throwing eggs at government buildings at a protest. That unusual style is earning him fans far and wide. Last month, he traveled to Moscow to meet Alexei Navalny, one of the main leaders of the opposition, who made his name through his own efforts to expose corruption in the government and state-owned companies. In messages posted on Twitter, Navalny described Mochalov and his assistant as "incredibly cool people" and "real heroes," and wondered how he has "managed not to get whacked yet." Mochalov says he is undeterred by any possible reprisal, legal or otherwise. Recently, prosecutors began to investigate an article that they suspect of inciting racial hatred, although no charges have been filed. He also shrugs off the threat of physical violence. Russia is the ninth most dangerous country in the world to be a journalist, according to the Committee to Protect Journalists, a New York-based watchdog. Since the collapse of the Soviet Union, 53 journalists have been murdered. More importantly for Mochalov, however, is the newspaper's continued popularity. Demand has been so great that he is considering selling copies to help cover its increasing costs. When he set up a makeshift stall at a market on a recent snowy afternoon, he was quickly surrounded by people who made off with several copies at a time. After 15 minutes he had given away several hundred. "The people have had it with all these corrupt people in power," Mochalov said, grinning. "They want to know the truth."